I’ve often found that some of the most innovative developments in Smart Home devices comes in the most specific use cases. In situations where device functionality or compatibility might be completely irrelevant for some, these pioneers drive the development of the Home Automation industry outside all the other “me too” products on the market (cough, smart plugs) to unlock new ways of thinking. Case in point: smart peepholes. Sure, the majority of the current Smart Home market is just fine using the current options of smart doorbells or smart surveillance devices for their access control needs, but there is a niche market for those searching for a superior alternative to the ancient peephole. 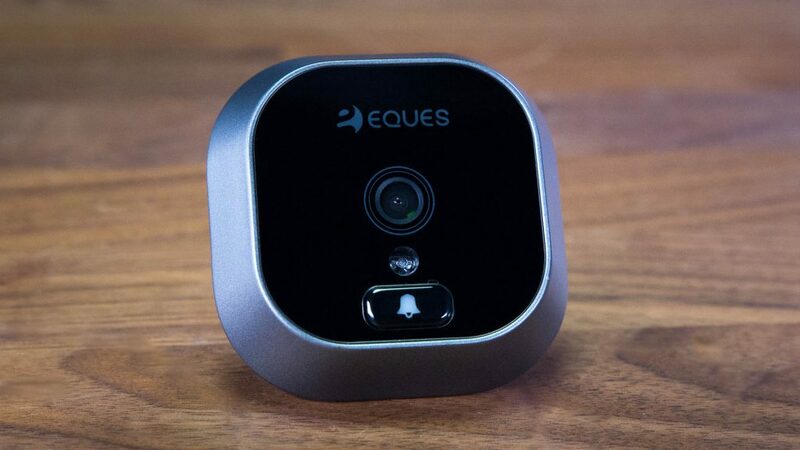 Indiegogo-funded Eques saw this opportunity for innovation and pounced, and launched a line of smart peephole devices, all designed to solve some of the problems with the peephole that hasn’t had a technology update since it was invented. My curiosity was piqued when I heard about their approach that rolled the functionality of a connected doorbell into new-age peephole technology, so I decided to take two of their models for a test drive— the $79 Greeter and $230 Veiu. Does Smart Security Really Matter? There’s a lot of chatter that floats around the interwebs whenever smart technology comes up, which generally revolves around price-to-value ratio or necessity. It’s true; smart devices (especially in the case of light bulbs and plugs) are considerably more expensive than their non-smart counterparts. For some, looking at the price tag alone and not digging any deeper might cause them to balk at the price difference, and scare off the casual observer. However, I (along with the majority of the tech community) argue that the enhanced control and utility benefits from connected devices offset the cost in many instances. Where we get to the unequivocal benefit of smart devices is when you enter the realm of security, where connected devices are leaps and bounds more advanced than other options on the market. Without running on for pages about the importance of Smart Home security (you can read my tirade about that all here): there are two areas where Smart Technology is truly impactful — awareness of activity out of eyesight, and as a deterrent for theft or robbery. 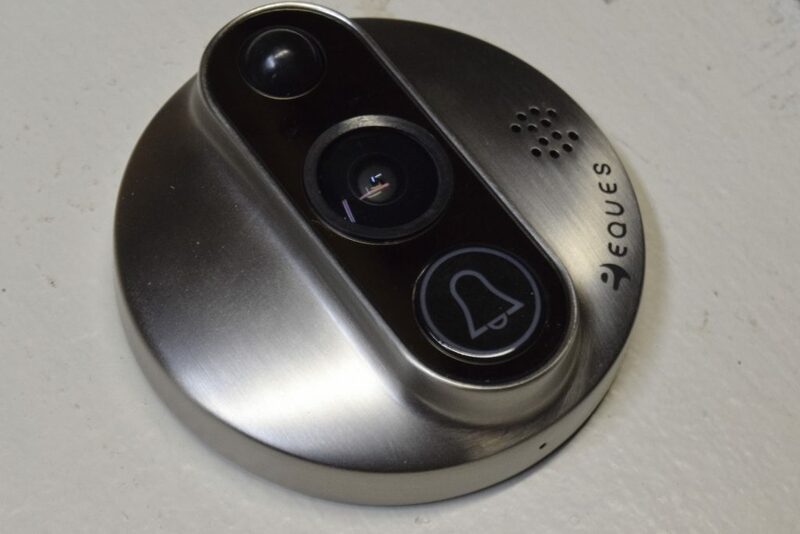 The first thing that came to mind when I saw the Eques Greeter and Eques Veiu was what a perfect option they would be for decking out a smart apartment, since many apartment doors come with a standard peephole already installed. Considering the minimal effort it takes to install the Eques smart peepholes with nothing more than a screwdriver, it also makes perfect sense for those in an apartment who may not have a lot of tools at their disposal. Also, apartments are notoriously finicky about residents drilling holes or modifying the structure so many smart doorbells are out of the question unless the screw locations match up perfectly, which is rare. Even then you might be taking a risk, and getting dinged with a bill for damaging the fascia of your home. After digging into the specs a little deeper, another perfect use case emerged that I really hadn’t given too much thought to before: elderly residents. 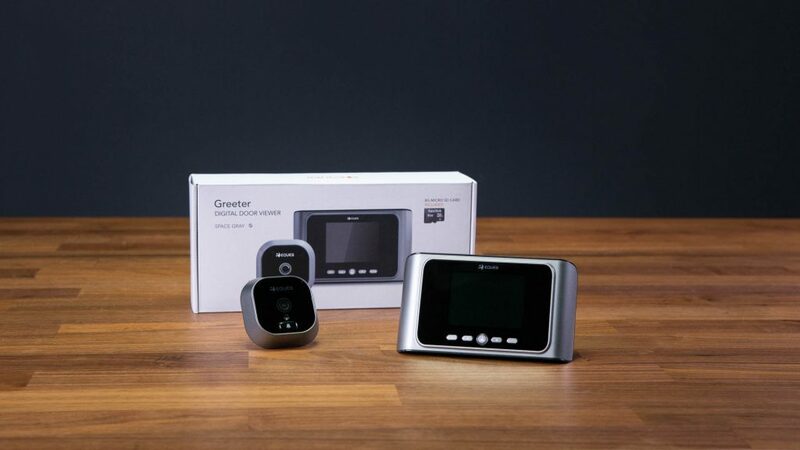 Most smart devices aren’t targeted towards users with limited tech integration in their lives, but with both the Greeter and the Veiu they have the option of full-use without a hub, any other connected devices or even a smartphone. The Eques Greeter peephole viewer is very well-constructed, with what feels like an aluminum construction and a mirrored black finish on the front of the unit. The smart peephole elements look really quite attractive, and not overly flashy in Space Grey (I can’t say the same for the Gold Earth model). I’m actually surprised at the heft of the peephole unit itself, but I’m glad they put the extra care into designing the outward-facing components. The internal-facing element has the same Space Grey housing, but uses plastic instead of metal. The feel is noticeably less durable and hefty than the external components, but you won’t be needing the weather resistance or durability to the same degree on this side of the door. 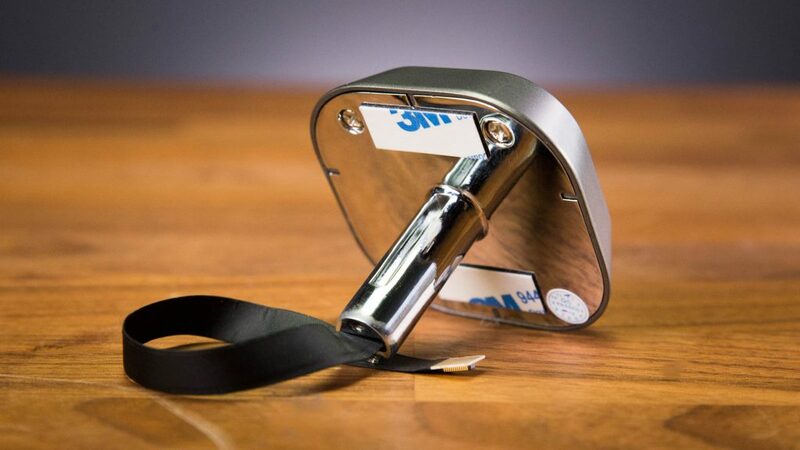 The setup is perfectly designed for users looking to leave no trace on their door; everything from the 3M adhesive tape on the back of the doorbell ringer to the design of the interior bracket attaching through the peephole spacer makes for a quick and painless removal if needed. The Greeter has a MicroSD slot for expandable local storage up to 32GB, which can be nice to transfer out for long-term storage if needed. To preserve space on the card, the Greeter also has an “Auto-Delete” function. This is similar to what is seen in auto dash cams, where it records the latest activity until the memory is full and then begins to overwrite the oldest files. This is the ideal setting with memory card devices, since it ensures you don’t fill up the card unknowingly and miss activity. With any smart surveillance device, the camera is undoubtedly going to be important. 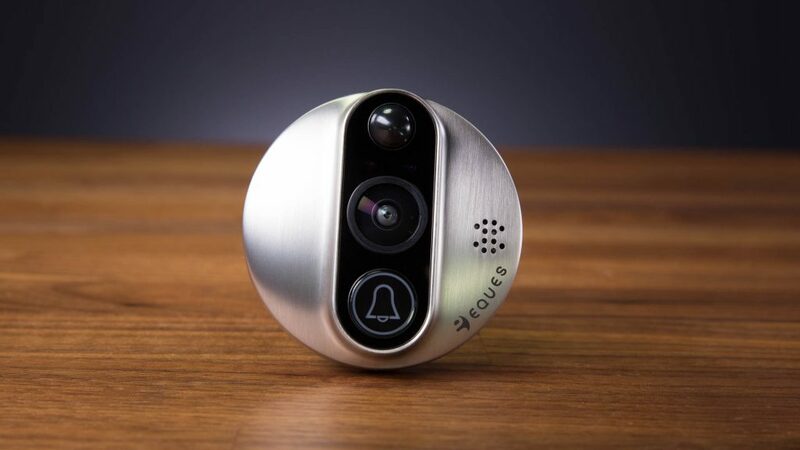 The Greeter’s camera has a 165° FOV, which can capture three, five, or ten-second video clips when the doorbell rings. If desired, the setting can be switched over to still photos in either 640×480 or 320×240 resolution, with an option for high or low exposure. The Greeter comes equipped with a 2.8” color LCD screen that displays at 320×240 resolution. The size and resolution aren’t the most visually stunning, but most people don’t spend a lot of time sitting next to the door watching through the peephole anyways so I don’t see this as a huge sticking point. Video details are visible though, and there are a few brightness settings to adjust as desired within the software. The interface looks a touch dated compared to most Smart Home devices, but again for being a budget option at $79 it really is simple to navigate through with the physical buttons on the viewing module. The exclusion of a touchscreen is undoubtedly for cost reduction, however it again is something that elderly folks (who might be unfamiliar with touchscreens) would be comfortable using. The Eques Veiu has a metal housing similar to the Greeter, however they come in either a brushed nickel or copper finish that looks quite pleasing and blends in well with other door hardware styles. The ringer button itself is larger and more apparent with the Veiu, and the unit has a lower (yet wider) profile on the door. With the Veiu model the FOV is increased to 180°, which is literally the most you could possibly go without picking up the door itself. Resolution on the camera is also increased to the standard 720p seen on most smart doorbells, with video and photo capture setting the same duration and resolution as the Greeter. The big visual upgrade with the Veiu is on the screen side of things, which is considerably larger at a five-inch LCD touchscreen with 960×540 resolution. The touchscreen is responsive, and quite sharp with various brightness settings to tone it down and save battery. Thankfully the interface is updated in the Veiu with a modern and familiar design, with easily navigable buttons and icons. The installation of either the Greeter or the Veiu is seamless and requires nothing more than a screwdriver for doors with peepholes currently installed. They utilize a universal-sized insert into the door, and you simply slide the peephole into the current hole and install two screws, plug in the camera and call it a day. For those without peepholes, the Veiu includes a drill bit hole saw to bore out a hole for the camera to slide into, which is nice since the size isn’t a commonly-used. Both can fit doors from 1.38”-4.33” thick, with two sets of screws for different applications. When it comes to the doorbell ringer, the Greeter has adjustments from levels 1-7, which should be sufficient to carry the volume throughout the house since the speaker is on the internal portion of the unit. With the Veiu users can select from one of three of ringtones, or can upload one of your own which is pretty cool. One thing lacking from a lot of the smart doorbells is variety of ringtones or customization, and while this isn’t by any means a major functional element, it is nice to see. The capture mode can be set to either auto or manual on the Greeter, in which the auto mode uses the ringing of the doorbell to trip the photo or video recording and manual is by the user engaging the recording from the unit itself. Manual capture didn’t make much sense to me until I discovered the video timeout and factored in the lack of motion-triggered recording. With the Greeter, the camera timeout can be set from five, ten, fifteen, twenty seconds. When the doorbell rings, the screen switches over to the live video feed, with a countdown for the pre-selected duration of the recording (three, five, or ten seconds) after the time is up, the live view continues for a few seconds, then times out. 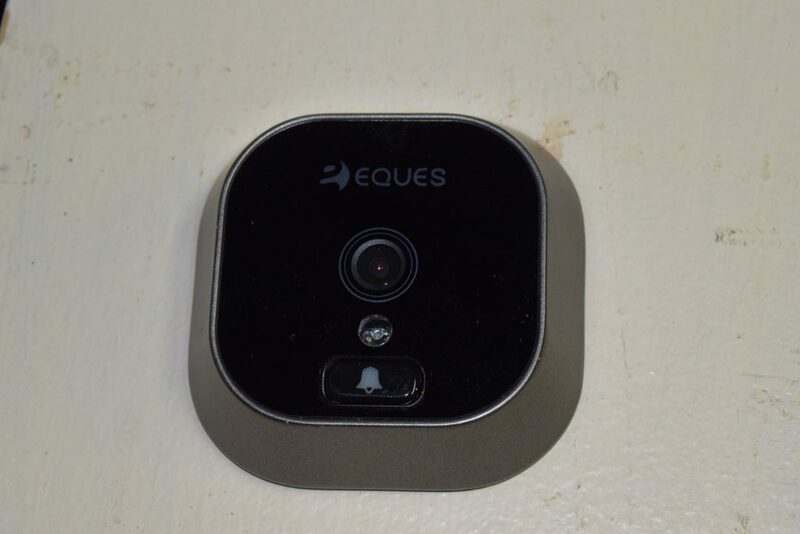 The timeout function is a touch on the quick side in my opinion because the recording starts from the doorbell ringing and not the motion detection. This means if someone is snooping around before ringing the doorbell, or after the video recording times out there won’t be evidence of this. At night the Greeter video quality is fine with some additional lighting, however in almost pure darkness it struggles to pick out any detail. If you were to use the Greeter (and really as a general security best practice) a porch light should be used as well. It should be noted that when exporting the footage to a PC the quality drops off significantly with the increased screen size, and while this is likely only the case with outlier scenarios, don’t expect to have crystal-clear details on your monitor or TV. The Veiu is set to automatic recording for ringing of the doorbell, but also can be set to a motion-sensing capture method that utilizes the PIRs (passive infrared sensors). With this model however, there are more flexible options for the camera timeout (15, 30, 45 seconds or 1 minute). 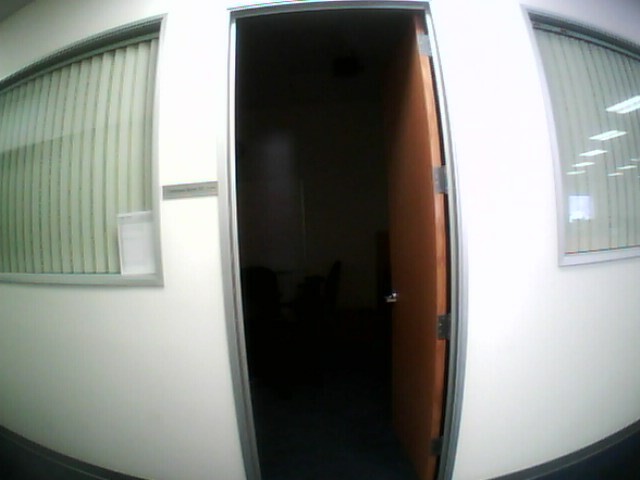 At 165° the Greeter’s FOV is substantial, and captures everything in front of the entryway that one would need to see. The edges do have a slight fisheye effect, but it isn’t so bad as to ruin the visibility (even for those without keen eyesight). The Veiu has a substantial 180° FOV, which is more than enough to capture any activity at your doorstep and beyond and the picture does not have any distortion towards the outer edges of the camera range. Unfortunately, the Greeter does not have a microphone so the video clips do not contain audio. This would be a good feature to have since it helps give context to video clips. It would also be great to include two-way audio for use as an intercom directly behind the door, so users could speak with visitors or dismiss them without having to open the door, as an added safety precaution. With the Veiu though, the audio quality is solid and there is no distortion or harshness to the feed that comes through. Also, when using the unit as a straight intercom without the app there is no element of feedback that often comes with the speaker and microphone interfering with one another which is nice. As wireless security cameras, battery life is a big deal for device effectiveness. The Greeter has a 1800mAh battery that is rated for 1-2 months of standby power while the Veiu has an 8000mAh battery with a two-month standby rating. When the unit runs out, you can unhook the interior screen and plug it in to recharge, without dismantling the system, unscrewing anything, or needing to run wires for operation. The Veiu has an interesting feature where it can be scheduled for Sleep Mode, which means that it disconnects from the server and basically shuts down for whatever time you set. This is designed to save power, and will reconnect when the timer is set to “awaken”. This seems like an interesting concept, although I don’t think I would use this since security is always a prime concern (whether at home or away). Available on the Veiu with Android 4.0+ or iOS 8.0+, the app interface itself is pretty basic, while not as attractive as many others I’ve seen from Home Automation companies it gets the job done. One key element is being able to tap into the live-view camera via the app, regardless of whether or not there is a motion alert or doorbell trigger. Many smart doorbells now include this however some don’t, and it does come in handy when checking to make sure everything is under control. The motion alerts can be customized to either capture a snapshot or video upon detection, and send a push notification to mobile devices for instant review. 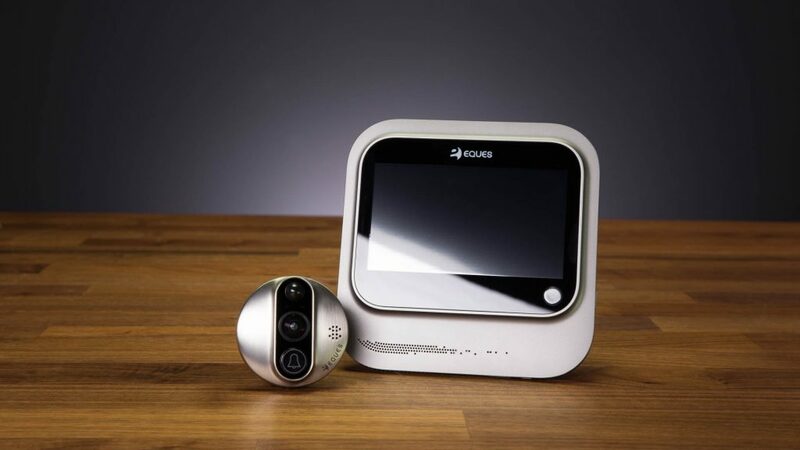 Both the Veiu and Eques app have free cloud storage and there is still local storage available on the smart peephole itself. Can you have a Smart Home without a Smartphone? I found myself in a bit of a dilemma when pondering the classification of the Eques Greeter as a Smart Home device. There is no app for it, which means that it isn’t quite as “smart” a device in the sense that we’ve come to know it as. On the other hand, it can be argued though that this is a smart device for the purposes of targeting those who wouldn’t want to fumble with a phone just to know who is at the door. Most elderly folks won’t have the need for a device that requires more effort to accomplish something, however the value of smart security is still there for anyone. This is the kind of innovative targeting that I think is brilliant with many home automation companies out there. They are designing something specifically tailored for a demographic that will find it super useful, and stripping out all the other elements that don’t align with the goal. For those looking to have a system that can be accessed via app and Wi-Fi for a more common “smart” solution however, the Veiu is the way to go. After using the Veiu (with their included hole saw drill bit for the smart peephole), I am a firm believer that this is actually useful beyond just the apartment audience, this is a regular Smart Home winner. The Veiu brings all the basic elements the Greeter does, and then elevates them to compete with the big boys of the smart doorbell space. 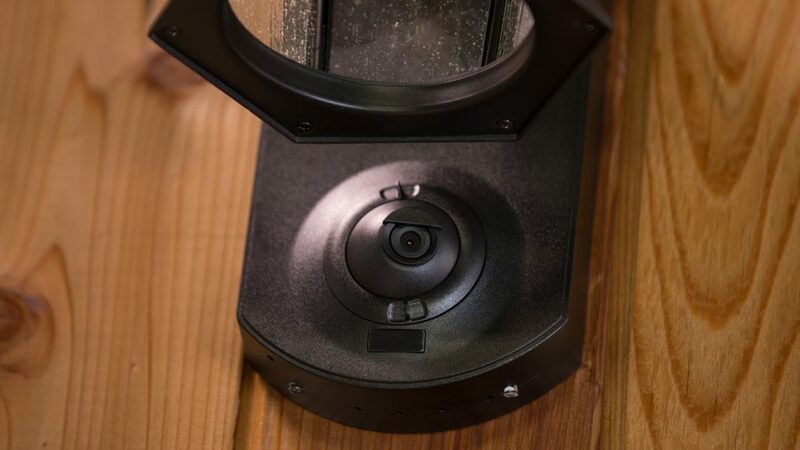 The improvements in the hardware, as well as the addition of the app and Wi-Fi connectivity make this smart peephole a great addition to the smart security space. 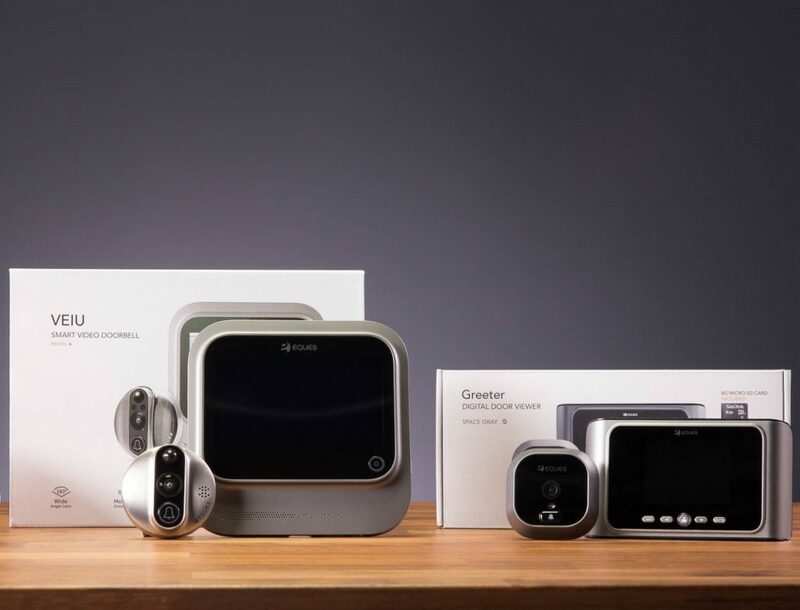 The Eques Greeter and Veiu are two of the most unique connected devices that I’ve come across, with a very strong value to a very specific demographic. Yes, both can be utilized by anyone in any home setting, however for me their utility is highlighted best in particular as noted for apartments, but also for elderly individuals. While it may seem counter intuitive for most Home Automation devices to function without the use of an app, in this instance it is a plus since many elderly folks might not have a smartphone (or have any use for one), but still want the benefit of easily seeing who is at their door. This is a great precaution for seniors, since both models allow for instant viewing from behind the door, without needing to walk all the way to the door itself. The Veiu especially has a large and bright screen and with the intercom function can protect them from opening the door for strangers. Another key perk of using the Vieu smart peephole for elderly folks is the ability for family members to use the app to keep tabs on the security of their loved ones, while still allowing them to have their privacy and autonomy. The remote notifications allow for a quick check to see if any sketchy characters are causing trouble, while also informing the family about who is coming and going. Interestingly enough, the Eques smart peephole duo (and especially the Veiu) have interesting benefits over some of the smart doorbells that we have come to know. These deliver Instant visibility of who is at the door without snatching up your phone to look at the app. Yes, that is all part of the functionality (and it does a nice job of it by the way) but if I’m sitting at home and the doorbell rings, or the motion detection goes off and I happen to be within eyeshot of the door, I don’t want to have to go check it out or pull up my phone. 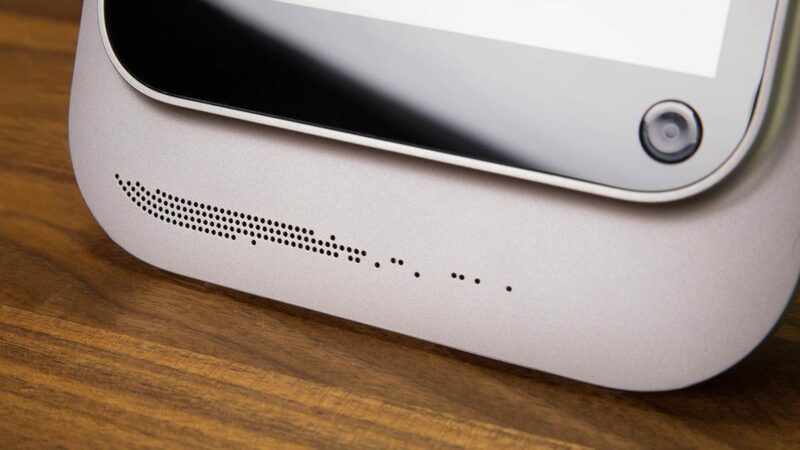 Eques has surprised me with their smart peepholes, and I can’t imagine I would have ever thought this to be a market within the crowded Smart Home space. While some recreate others innovate, and this is definitely a unique device for the connected ecosystem. The Smart Home space is rapidly progressing, but few companies are painting outside the lines to develop innovative technology. Eques has developed a series of smart peepholes that deliver specific utility for an under-marketed segment, while achieving something the big names in smart access control have not.